With electoral turnout decreasing and disenchantment with the political class on the rise, many so-called ‘established’ democracies – Australia among them - suffer from symptoms of disillusionment. If elected power-bearers are not responsive to citizens’ wishes and differences between political parties become unrecognisable, why bother voting, as some argue? A re-thinking of political engagement is taking place, alongside the transformation of citizens from relatively complacent voters to continuous monitors and scrutinisers of power. The spread of new Information Communication Technologies (ICTs) and in particular the mobile internet has certainly transformed modes of civic engagement around the globe, enabling such new models. With the number of mobile subscriptions exploding from under 20% to over 90% of the global population between 2001 and 2013, mobile information-sharing tools such as voice calls, text messaging - and increasingly internet functionalities - are becoming ubiquitous in some regions. In this new ‘network age’, information is “generated by anyone, transmitted to anyone/anywhere”, no longer limited by news media and their traditional gatekeeper function. The optimistic view sees ICTs as generating countless possibilities for meaningful, spontaneous political participation of everyday citizens armed with smartphones and tablets – thereby expanding political, social, and economic freedom, enhancing democratic governance, improving service delivery, and bringing about more transparency and accountability (see for example the works of Yochai Benkler or Clay Shirky). Yet, just how transformative these sometime enthusiastically branded ‘liberation technologies’ are is a matter of fierce contention. Arguments have been made that there are either negligible effects or even an increase in the repressive surveillance capabilities of states. While such academic debates contribute to the theoretical understanding of ICTs, citizens around the world simply appropriate them for a diverse range of purposes. Southeast Asia - a region with rapidly growing mobile internet penetration – has seen its fair share of ICT-afforded initiatives. Violent conflict is mapped by citizen reporters in Southern Thailand, corruption is exposed in Indonesia, and shortly after typhoon ‘Yolanda’ struck the eastern Philippines, volunteers began tagging tweets and sifting through huge amounts of social media noise to aid the disaster response. Alongside aid and disaster response, ICTs have more recently proved themselves invaluable in the highly contested field of democratic elections. Empirical evidence shows that throughout the region ‘crowdsourced election monitoring’ initiatives are on the rise (see Table 1). Volunteer networks – sometimes led by domestic election watchdog NGOs - tap into the latent observational capacity of the citizenry at-large to monitor instances of electoral misconduct. Within this system "any individual can register an observation about an election [which is] is pooled with other individuals' observations to create a public depiction of the reality of the election that is offered back to the public and to election officials in real-time on election day" (see Archon Fung’s definition). In practice, this means that information provided by citizens via email, social media, phone call or SMS is aggregated and displayed online - usually in the form of a map. Different software solutions exist, but many projects make use of the open source Ushahidi platform combined with FrontlineSMS or another service to gather text messages to a dedicated number. Only two of these projects rely solely on the general public to supply reports on election misconduct. The others have a component of ‘bounded crowdsourcing’, in which a number of trained or recruited volunteers are tasked with submitting reports. These volunteer networks differ in size and training and provide what Jean Paul Lederach calls a ‘trust network’. Since the ‘bounded crowd’ is trained in identifying electoral malpractices and adheres to a certain protocol for reporting, incoming information is considered more reliable and trustworthy than reports from the general public. In order to verify reports from ordinary citizens, platforms use different techniques, usually ‘manual verification’ – meaning trained members at platform’s HQ manually go through all reports and try to corroborate them by finding second sources or calling the reporter back. 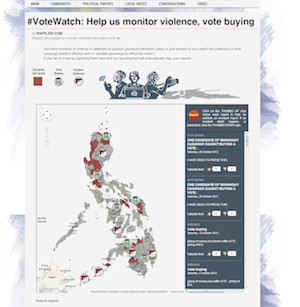 Only one platform - #VoteWatch in the Philippines - uses an innovative rating system, in which users give ‘thumbs up’ or ‘thumbs down’ on reports. Borrowed from online shopping sites, such rating systems employ a probabilistic epistemology of truth and are useful to increase trustworthiness of users, but only if the crowd is sufficiently large. Amidst talks of ‘post-democracy’ and the deepening crisis of representation and participation in countries like Australia and other OECD democracies, one might find it peculiar, even ironic, that Southeast Asians wholeheartedly embrace ICTs to keep a watchful eye on elections - a reputedly outdated mechanism of representative democracy. But when we look at the surveys from the third wave of the Asian Barometer, it becomes clear that classic democratic procedures such as elections are still held in high regard in the region. 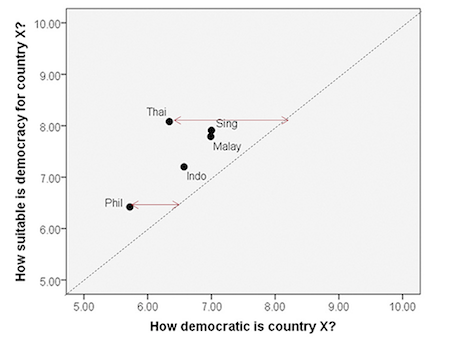 When asked how suitable democracy is for their country, and how democratic the country is at the moment, responses from five Southeast Asian electoral democracies showed a certain democratic deficit. The perceived reality lags behind democratic aspirations (see Figure 2). 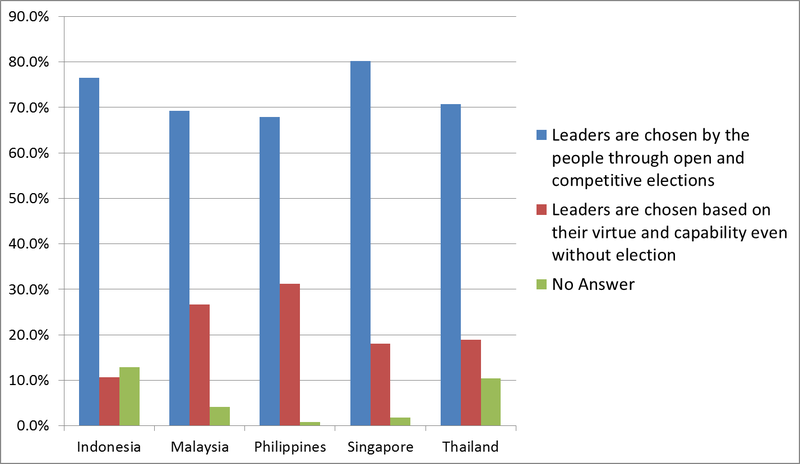 Similarly, when asked about the meaning of democracy, respondents exhibited a very strong preference for competitive elections (see Figure 3). These two admittedly crude measures of democratic preference are certainly far from exhaustive, but nevertheless hint at the fact that Southeast Asians value democratic procedures and find a source of empowerment in elections. It should therefore come to no surprise that civil society rallies around new opportunities of scrutinising the electoral process to ensure its democratic integrity. These are important developments to understand the changing dynamics of the relationship between citizens and the state in the region. Crowdsourced election monitoring can be considered an instance of norm entrepreneurship by civil society actors and it implies at least two different types of citizen-state interactions: citizen co-production and societal accountability. Crowdsourced monitoring exponentially increases the speed and amount of information available on electoral misconduct. The mission statement of the East Timorese Belun Crowd Map claims that this information will be used “to inform state, civil society and international actors, enabling a swifter response to incidents of conflict or violence.” In a similar vein, volunteer reports from Bersih’s Jom Pantau initiative are to be verified and “forwarded to relevant government agencies, such as the police and the Malaysian Anti-Corruption Commission (MACC)”. Finally, the Cambodian election watchdog COMFREL – initiator of Cambodian Voter Voice - set up a situation room around election day to funnel NGO and citizens’ reports directly to the National Election Commission - the state actor mandated to combat electoral misconduct. The clear expectation in all these instances is that state agencies such as election management bodies (EMBs) should make use of the increased availability of information to improve their work. This echoes ideas of ICT-enhanced ‘citizen co-production’ of public service delivery. Citizen reports of problems with voter registration, missing equipment, difficult access to polling stations, irregular opening hours, vote-buying, intimidation etc. can be used by the state to perform its mandated oversight function in a more efficient and timely manner. A similar example from a different sector is the web platform See-Click-Fix, which relies on citizens’ reporting of local problems like potholes, graffiti or pest infestations. The exponential growth of actionable information generated through crowdsourced reporting is meant to lead to public action. Unfortunately, in the Cambodian example, the vision of citizen co-production fell short for a number of reasons, not least because the election commission refused to engage with the situation room. In essence, it was ‘See-Click’ without the ‘Fix’. Nevertheless, regional developments such as the recently propagated Bangkok Declaration on Free and Fair Elections support similar ideas of increased co-operation between civil society actors and EMBs to deliver clean elections. What has not yet been addressed is the question of how viable ICT-enhanced citizen co-production can be if state organs are not willing to engage constructively. After all, in electoral autocracies it might be the very purpose of the election commission to ‘deliver the vote’, and not to ensure clean elections. It was precisely such allegations of collusion between the election commission and the ruling party that led to the so-called ‘People’s Tribunal’ in the aftermath of Malaysia’s 13th general election of May 2013. Initiated by the Bersih coalition, the tribunal was meant to examine evidence of systematic election fraud and the state’s involvement in it. The election commission was invited (and predictably abstained), but this exercise was much more confrontational and antagonistic vis-à-vis the state than the notion of friendly co-production discussed above. In addition to the tribunal, diverse civil society groups organised large-scale demonstrations – among them the so-called ‘black-out’ protest at a stadium outside Kuala Lumpur which drew 50,000 attendees. The developments in Malaysia as well as massive ongoing post-election protests in Cambodia are important indicators of the second ideal-type of citizen engagement, which draws on notions of ‘societal accountability’. This refers to mostly non-institutional mechanisms by which civil society holds public power bearers accountable in-between elections. It relies on the activation of traditional mechanisms of accountability (e.g. the legal system) as well as the deterrent and punitive effects of political and reputational costs incurred through acts of protest or publicising of scandals through the media. These can amount to non-mandatory but still effective sanctions. Importantly, this model of citizen engagement includes the expectation that exposure of fraud leads to the mobilisation of protest. Crowdsourced monitoring is well-suited to provide leverage for mobilisation, since it provides real-time information coupled with vivid depictions in the form of photographs and videos. Furthermore, it already employs the tried-and-true technologies that facilitate protest mobilisation – social media and mobile phones. Looking at the mission statements of the Southeast Asian monitoring initiatives confirms this second ideal type. Jom Pantau aimed to “further enhance the aspirations of people who want a free and fair election by mobilising people to serve during the GE-13 to monitor the electoral process, to prevent and reduce the efforts of fraud and misconduct during the election.” Vote ReportPH in the Philippines is even more explicit by aiming “to inform, organize and mobilise the Filipino people to push for meaningful reforms in the 2013 automated polls with the aid of new media technology.” Notable is the language of ‘exposure’ and ‘mobilisation’. For such activation strategies to work, it seems crucial that a level of linkages and trust exists between the crowdsourced initiative and existing organisational infrastructures that can turn the incoming reports into political pressure. There are indeed some normative ideas about citizenship implicit or explicit in the existing applications of crowdsourced election monitoring in Southeast Asia which could benefit many OECD countries, Australia included. On the one hand, the state and citizens can extend a hand to each other to engage in a ‘co-production’ of elections. Public confidence in the process is likely to increase through this. On the other hand, citizens act as ‘citizen sensors’ and mobilise for societal accountability – figuratively raising their fist to the state. It is of course entirely possible that patterns of individualistic, monitorial types of citizenship prevail, as has been observed in the OECD world - with people withdrawing from institutionalised politics and employing ICTs to become active only if their immediate interests are at stake. As the survey data suggest, elections seem to be of greater importance to Southeast Asians than cynical impressions from ‘established’ democracies might suggest. Australia has seen numerous similar applications of ICTs. For instance, the Open Australia Foundation’s ‘Right To Know’ website empowers citizens by considerably streamlining requests under the Freedom of Information Act, and the ABC engaged in crowdsourced mapping of flood events in Queensland. However, as the rise and fall of the prominent Bushfire Connect site shows, the continuance of such initiatives depends not only on enthusiastic citizens but also on funding. As of now, the state is by and large still reluctant to empower citizens in such innovative ways. The two types of citizen engagement presented here are not mutually exclusive. It seems that state actors are cautious to engage in the co-productive approach – perhaps due to an inherent and diffuse suspicion against opening the door to the unruly participation of the populace-at-large – which only makes the more disruptive and confrontational model of societal accountability more likely. This topic was presented on 9 November 2013 at the symposium on “Space, Power and Democracy”, as part of the five-day Festival of Democracy at University of Sydney.